Contrary to popular belief, “Rock Around the Clock” was not the first Rock ‘n’ Roll record to be recorded. In fact, it wasn’t even Bill Haley’s first Rock record. “Rock Around the Clock” was, however, the first-ever Rock ‘n’ Roll song to hit the #1 spot on the pop charts. It transformed rock from a novelty and a curiosity to a dominant force in popular music, paving the way for the brilliance of Chuck Berry, Little Richard, Buddy Holly, Elvis Presley, and countless others. If it wasn’t for the musical tastes of one teenage boy, the song that made Rock music cool and mainstream might have disappeared into obscurity. 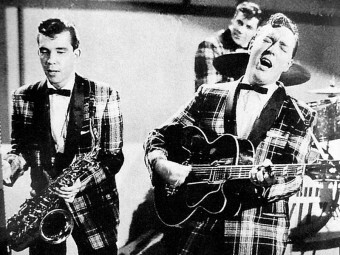 When Bill Haley recorded “Rock Around the Clock”, his producer insisted on slapping the song on the B-side of the record. For anyone who doesn’t know, the B-side of almost any record is the lesser important side. It is traditionally reserved for experimental songs, half-hearted instrumentals and throwaways. In other words, the B-side is usually “filler”. Selected for the A-side was a song called “Thirteen Women (And Only One Man in Town)”. Know it? Of course not- almost no one does. Having spent most of their studio time on the A-side, Bill Haley and his session band had only 40 minutes to arrange “Rock Around the Clock” (hardly rocking around the clock then while recording it). “Thirteen Women (And Only One Man in Town)” was released and barely touched the lower reaches of the charts before quickly disappearing from American pop-culture history. And that’s where our story would have ended, if it wasn’t for a teenage boy named Peter Ford. OK, let’s get back to our story. Ford and the producers decided that they needed some music in the film that represented what the kids were listening to. Hmmm… Glenn Ford had a teenage son. So, they decided to raid Peter Ford’s record collection where they found “Rock Around the Clock”. It fit the bill perfectly, so they set the opening and closing credits to the song. “Blackboard Jungle” was released on March 25, 1955. The movie and the song both proved to be smash hits. Kids flocked to the theater, but for an unprecedented reason: they often came not to watch the film, but to hear its theme song play in the credits. In England, there were small teenage riots where “Blackboard Jungle” played, as young “Teddy Boys” (English for tough gang members) would often rip out seats from the theater. “Rock Around the Clock” and Rock ‘n’ Roll indelibly became associated with the young and rebellious. After it was hastily reissued as an A-side after its success in the movie, “Rock Around the Clock” shot to #1 on the charts. It stayed there for eight weeks. It would go on to sell 25 million copies, making it one of the bestselling records of all time, in any genre of music. It makes you wonder how many other would-have-been hit songs are out there that never saw the light of day.